Your Minnesota Vikings (6-4-1) go to Foxborough to face the New England Patriots (8-3). Read on to see the 3 Keys to beating the Patriots, 2 key players, and 1 conversation with a special guest. The New England Patriots have been 19-1 when TE Rob Gronkowski has caught one or more touchdowns. The Vikings did a good job of containing a washed up Jimmy Graham last week with a couple of nice defended passes by Jayron Kearse. Kearse and Harrison Smith will likely be on Gronk all game. Gronk, who claimed that he is 100% this week after being riddled with injuries for most of the season. Gronk looks to quiet people who claim that his best football is past him after his retirement talks. The Vikings defense terrorized Aaron Rodgers last week, sacking him and hitting him countless times. This week, they face a non-mobile quarterback in Tom Brady. You don’t see Brady running all over the place. He usually just stays in the pocket, so if Minnesota’s four man rush can consistently get to Brady, forcing him out of the pocket and ruining the timing of his throws would be huge given that low secondary depth. This year, when pressured, Brady has looked significantly worse then he looked under pressure in recent years. If the front four can get pressure early and often like in the Packers game, they could render Tom Brady ineffective like Aaron Rodgers last week. Pressure from the front four will allow for the rest of the defense to play coverage forcing Brady into tighter windows in quicker periods of time. 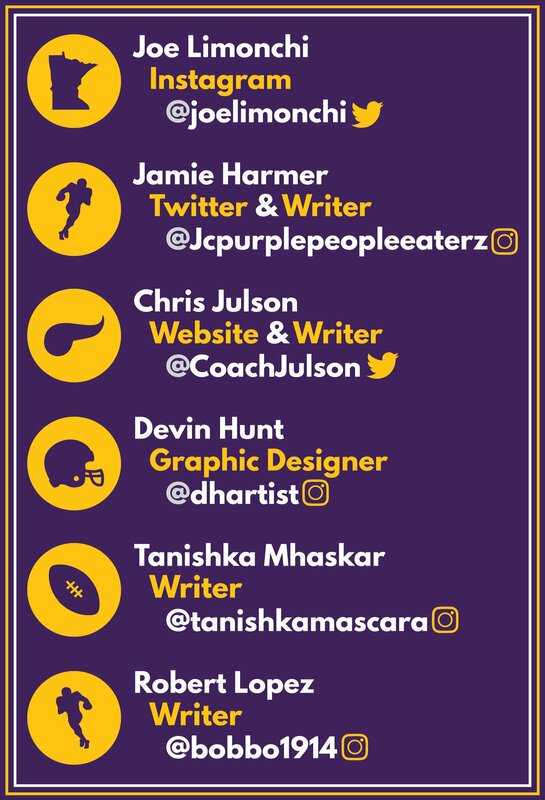 The Vikings need to run the football. They have the pieces to do it. If Minnesota wants a chance in this game they must establish the run early, even if it is short yardage. Keeping balance versus an experienced team like the Patriots is very important. Last week, we saw the screen game work very nicely, an element that had been missing from this Vikings offense. When Dalvin Cook gets into open space...well good luck defenders. Mike Zimmer said last week that the Vikings were very close to breaking big runs. “We just needed that one final block.” Let’s hope the Vikes get all their blocks this weekend. Xavier Rhodes listed to be a game time decision thins Minnesota’s cornerback depth. On the other side, Josh Gordon and Tom Brady are finally starting to build a rapport after the loss to the Titans where Gordon caught only four passes in 12 targets. 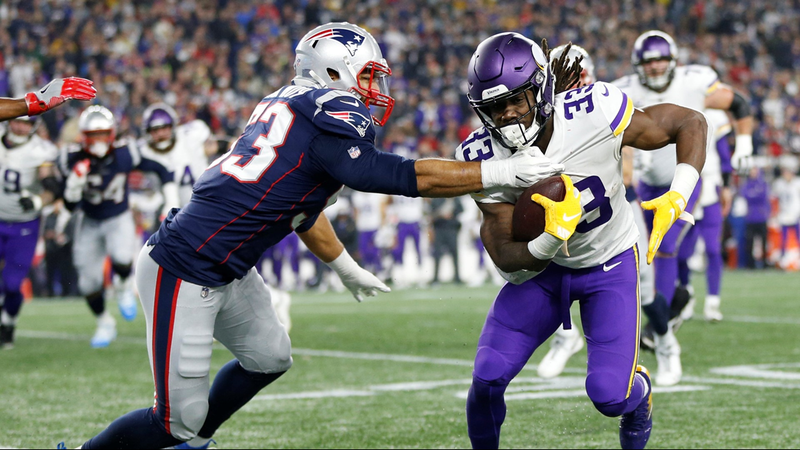 Containing the Patriots many speedy weapons can be tough without Xavier Rhodes, the all-pro, but Gordon has been the nice deep threat that the Pats had been looking for. Harrison Smith is one of the most versatile players on the defense. He can line up at any position from Linebacker to Safety. He can play in coverage but is equally as comfortable playing at the line of scrimmage. Packers fans saw that last week when he had made a crucial stop behind the line on a 4th and inches. Many have come out stating the greatness of Smith last week. Bill Belichick had even come out comparing him to Ed Reed. wherever Smith lines up he always poses a threat and Brady must be aware at all times. I was able to talk to my friend Luke Caplice who is a huge Patriots fan to get some of his views on Sunday's game. What player on the Patriots do you think will have a large impact of the game? I think Josh Gordon will surprise the NFL this week since his first few games have been short of our expectations. Josh Gordon has a ton of potential and will be used as a major threat in tandem with Julian Edelman from the Patriots offense. However, Dorsett may substitute Edelman this week for a majority of playing time due to Edelman’s foot related injury. As far as the Patriots defense, Trey Flowers will challenge Cousins all game in addition to tight coverage from Gilmore and McCourty. Which player on the Vikings do you think will cause the most problems for the Patriots? Thielen and Diggs because of the constant threat they have posed to the corners on other teams. If you try to take away one of them the other one will take on their workload. I feel like Thielen is more dangerous because of his ability to play out wide and in the slot. This will make it hard for Gilmore to shadow him as he rarely plays vs the slot. This will let him draw easier matchups and be a threat through the entire game. What Patriots running back has been most impressive this year and how do you think they will fair vs the Vikings? Sony Michel has been the most impressive running back for the Patriots this year because of his high performance as a rookie. Michel had 1 TD and 133 yds last game against the Jets and 106 yds against the Chiefs, granted it was a high scoring game. Michel fills a void in the Patriots running game and will become more consistent as the weeks pass by. Michel will be a challenge for the Vikings to control but with the right strategy, Michel may be tamed. However, Michel’s patterns show that he should have a breakout game this week.